For this artist at least, there’s always a sense of urgency. There’s no time to lose so we have to make hay while the sun shines. In Vermont we make the best of a short summer season. 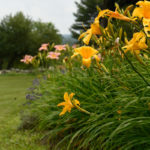 The Day Lilies in a friend’s garden know how to roll. Thanks Dianne and John Tolbert! It’s been several years since I’ve conducted a workshop. I’m excited to announce I have two planned for this fall. 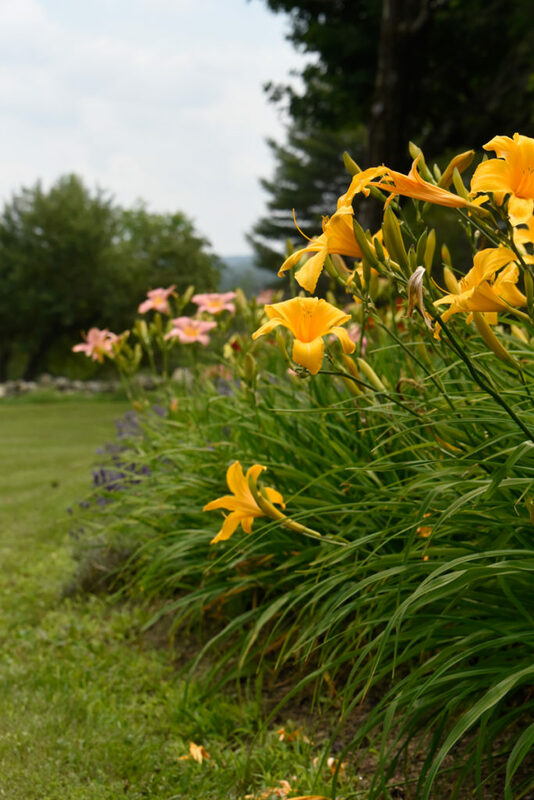 The first will be a weekend retreat workshop for intermediate/advanced students at The Vermont Inn, October 21 &22. The second workshop will be a weekend in November, in Vermont’s Northeast Kingdom. More on that workshop coming soon. Each month I draw two random Day in Vermont subscribers to win a free print of their choice. It’s one small way I can say thanks for your amazing support. A few of you may have seen me painting this at Art in the Park a couple of weekends ago, so I wanted to share the finished piece. 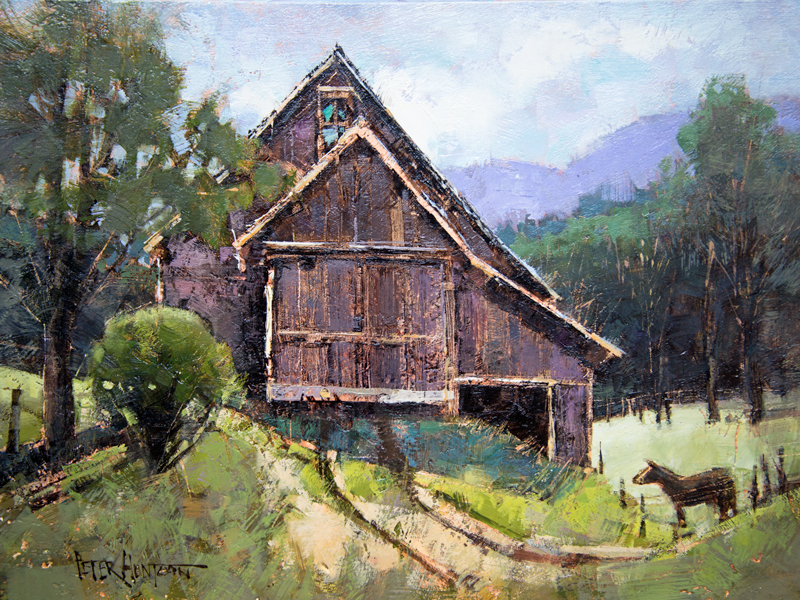 It was started on location, (“en plein air”), at the MoonRise Farm in Taftsville, Vt. Enjoy! Lovely painting…love the Moon Rise Farm too. I swear, every new painting I see, is my new favorite. I just love these two! What an interesting, and curious barn! Love the painting! I live in Door County, the “Cape Cod of the Midwest”, and we still (fortunately) have a good number of barns around to photograph – and paint! Thank you for the weekly taste of Vermont. Burning yellow jumps into your eyes! What a delightful view into the garden. Much quieter seems to be the barn of the MoonRise Farm but the construction reminds me of barns in my hometown. This is pleasant. As written in the gospel of Matthew 6:29 “Learn a lesson from the way the wild flowers grow…not even Solomon in all his splendor was arrayed like one of these.” Thank you for giving us viewers a chance to ponder the beauty and joy of today’s subject. 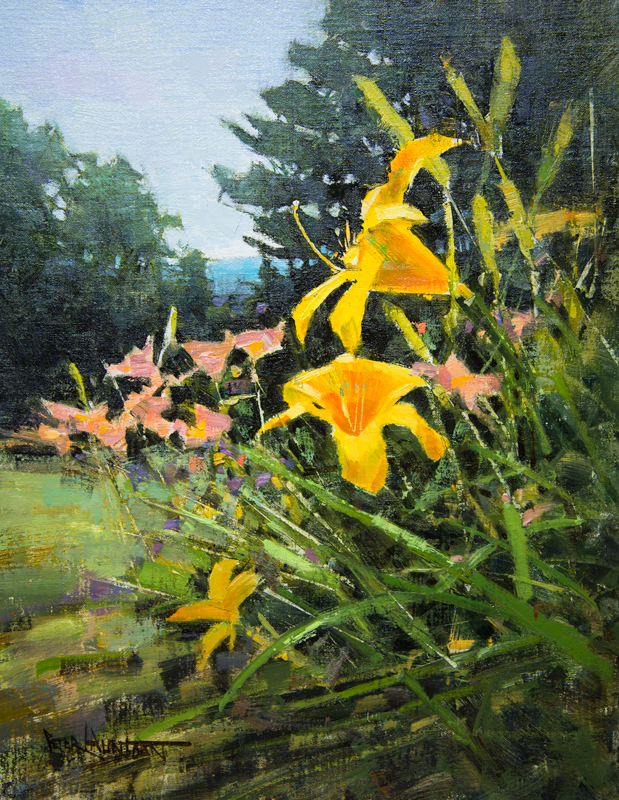 Your painting is a rich and wondrous celebration of one of the many gifts of summer in Vermont. We sure can learn a lot from Nature, Brian. thank you! I am replyi9ng to the picture of the beautiful flowers. Such a lovely painting of the flowers or lilies. I love that we have these in our state. Riding by Lilies by the road in our state is a thing of beautity I don’t see anywhere else.